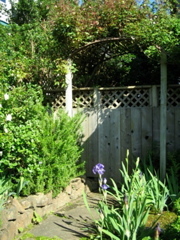 Also visit the back yard and wooded walk. Don't forget to pay special attention to the irises. 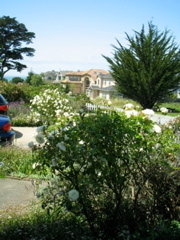 Stepping out our front door. 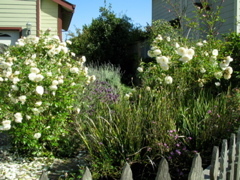 Greeted with roses and lavender. 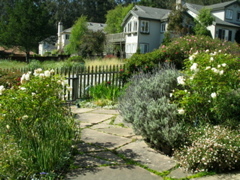 Upper front corner of the driveway. 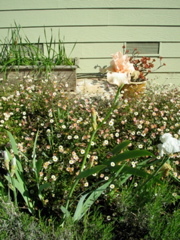 Bearded iris and roses nestled into the rockrose and bordered with a small daisy. Stroll the path up with more iris. 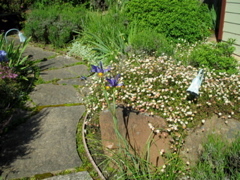 Rock mounds and fairy paths. 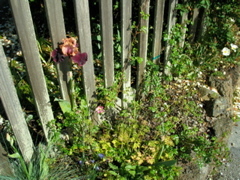 It must be spring the bearded iris are in their glory. Gate to the upper woodland walk. 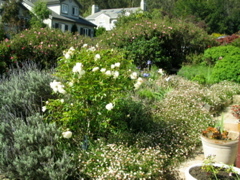 Enter via the rose arbor. Sitting on the bench at the top of the walk for a few quiet minutes. Looking out to the Pacific Ocean. 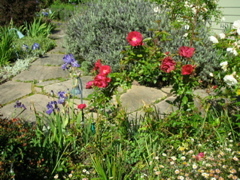 Iris, poppies, roses, and more - oh my! 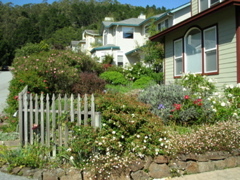 Along the street side. 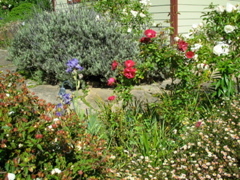 A constantly changing foreground with rockrose and roses for background. 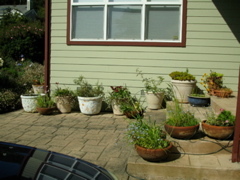 Pots lining the entry deck. 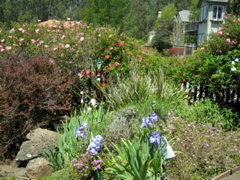 Bulbs with every different type of spring, summer, fall variety and mini fairy roses. 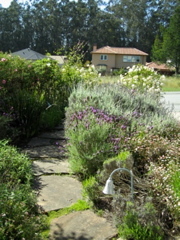 Walk way on the lower side of the front yard. Lavender and more lavender. 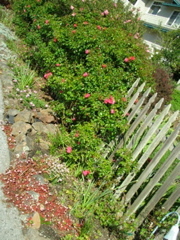 And roses and a volunteer peach tree.